Original Sorsogon Pili Festival crown missing? 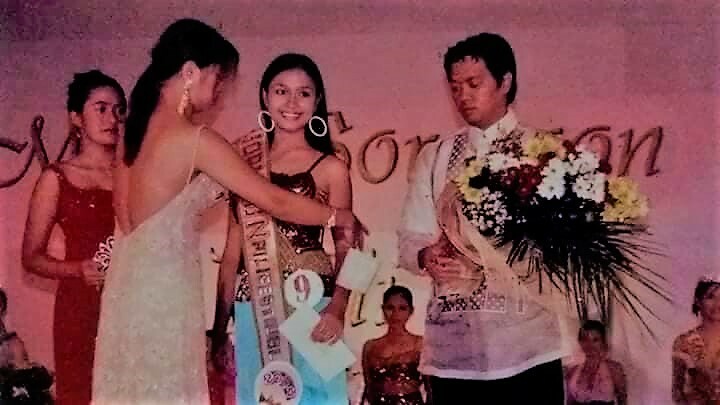 The first crowned Miss Pili Festival 2004, Jona Lou V. Lanuza [center] with Governor Robert Lee Rodrigueza. Photo courtesy by Edgar Tumangan. Legazpi City, [06.20.17] – The original tiara which was awarded to the first crowned Miss Pili Festival pageant thirteen years ago is nowhere to be seen after it was borrowed a year after from the first title holder, Miss Jona Lou V. Lanuza, a highly placed source said. A source who interviewed the brother of Lanuza over the weekend has informed the Philippine Examiner , that her sister has expressed sadness that until now the borrowed crown remains unreturned to her. “It is my fervent wish that before the coronation of Miss Pili Festival 2017 this forthcoming June 25 the crown should be returned,” the source quoted his sister. The Miss Pili Pageant was organized by Sorsogon Governor Robert Lee Rodrigueza in 2004 and Jona Lou V. Lanuza was adjudged as the first Pili Festival queen, thirteen years ago. The Pili Festival is a celebration of abundance, blessings, peace and bounty that showcases Pili [Tree Canarium ovatum], which is indigenous to the province of Sorsogon. Pili festival kicks-off every June 23 every year, with a concelebrated Holy Mass, Pamarahaw Fiesta Festival, Tiriladan sa City Hall, Opening and Blessing of House Expo and Street Showdown Competition. The festival’s culmination falls on June 30, the day Sorsogon City was declared as Character City.